If you are missing all your teeth, Dr. Newkirk can make you a beautiful and functional set of dentures. The quality of removable dentures varies greatly. There are shortcuts that can save money. Some dentures are made entirely of cheap plastics that stain and wear easily, besides breaking easily. Tougher and more stain-resistant materials cost more but will save money over the long run. And some fabrication techniques use shortcuts that save steps, but the result isn’t as comfortable or as functional. If the fit isn’t precise, they can come loose at embarrassing times, and your ability to chew will be compromised. Dr. Newkirk pledges to use only the best materials and most careful, thorough techniques. 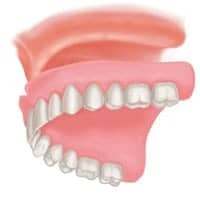 The result will be a denture that gives you a beautiful, natural-looking smile that won’t stain and will stay put when you laugh, yawn, or talk. 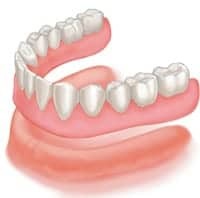 If you want the very best in dentures, we encourage you to consider implant-supported dentures. Newer dental implant technology solves all of the problems that have traditionally been associated with removable dentures. Chewing efficiency is preserved. Well-fitting removable dentures will give you only about 50% of the chewing efficiency you are used to with your own natural teeth. Because of ongoing bone resorption, this efficiency decreases every year you wear them. If they are stabilized with dental implants, most of your chewing efficiency is preserved. By using dental implants, you can eliminate the necessity of covering the palate. This preserves the natural taste and enjoyment of your food. You prevent facial collapse. When all the teeth are gone, your body begins to dissolve away the bone that used to support those teeth, so that the minerals can be used elsewhere in the body. The presence of dental implants prevents this resorption. Click the link to read more about facial collapse. They will not slip or come loose at embarrassing times. Difficulties with speech are eliminated. There is a full range of options available if you want implant-supported dentures. The more dental implants that are placed, the more stable the result will be. The fewer, the lower the cost. And, of course, the least expensive is to simply have removable dentures without any implants. If you want to learn more about options for your situation, give us a call, or visit our request an appointment page. Dr. Newkirk has extensive experience with dental implants and is one of the leading dental implant restorative dentists in the Chicago area, based on the number of implants that he restores. Click here to read more about dental implants.